Recent advances in technology have allowed doctors to "map" the brain from birth, giving them a clearer understanding of how the first years of life contribute to lasting changes in the brain. Their studies show that a child's early development is determined by his daily environment and experiences, rather than genetics alone. Researchers now believe it is the plasticity of the brain, its ability to develop and change in response to the demands of the environment, that enables a child to learn to use computers, solve mathematical problems and learn foreign languages. A child is born with over 100 billion neurons or brain cells. That's enough neurons to last a lifetime, since no more neurons will develop after birth. These neurons form connections, called synapses, which make up the wiring of the brain. At age eight months an infant may have 1,000 trillion synapses. However, by age 10 the number of synapses decrease to about 500 trillion. The final number of synapses is largely determined by a child's early experiences, which can increase or decrease the number of synapses by as much as 25 percent. The brain operates on a "use it or lose it" principle: only those connections and pathways that are frequently activated are retained. Other connections that are not consistently used will be pruned or discarded so the active connections can become stronger. 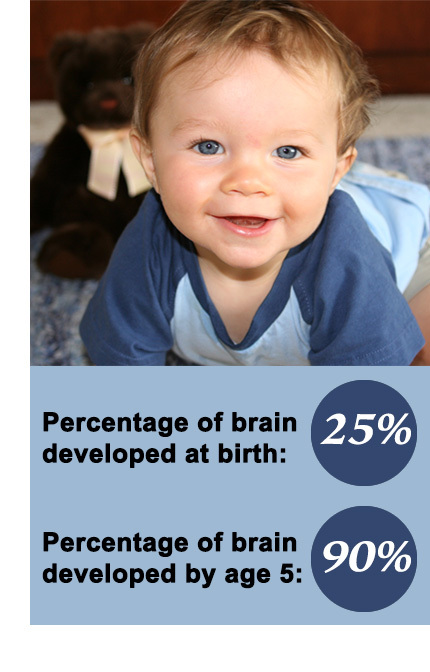 When an infant is three months old, his brain can distinguish several hundred different spoken sounds. Over the next several months, his brain will organize itself more efficiently so that it only recognizes those sounds that are part of the language he regularly hears. During early childhood, the brain retains the ability to relearn sounds it has discarded, so young children typically learn new languages easily and without an accent. Warm, responsive caregiving not only meets an infant's basic, day-to-day needs for nourishment and warmth, but also responds to their preferences, moods and rhythms. Recent research revealed that premature infants who were gently massaged three times per day for 15 minutes gained more weight, were more alert, and cried less. The way that parents, families and other caregivers relate and respond to their young children, and the way they respond to their children's contact with the environment, directly affect the formation of the brain's neural pathways. Caregivers can encourage brain development by directly interacting with small children in countless small ways every single day. When dressing a child, name items, colors, and count. When fixing dinner, let toddlers play with plastic dishes. Point out things that are the same, different, bigger, smaller, hot, cold. Outside of the house, point out what you pass: trees, cars, big trucks, stop signs. By exposing children to complex musical sounds (Mozart, not hard rock), children will develop the same areas of the brain required for math and spatial reasoning. Using mazes, copying patterns, and drawing shapes has been shown to improve with exposure to complex musical sounds. Researchers who examine the life histories of children who have succeeded despite many challenges, have consistently found that these children have had at least one stable, supportive relationship with an adult early in life. Als, H., & Gilkerson, L. (1995). Developmentally supportive care in the neonatal intensive care unit. Zero to Three: National Center for Clinical Programs. 15 (6). Ramey, C. & Ramey, S.L. (1996). "Music of the hemispheres." Discover.